We all hear every day that crime rates are rising. How can you protect your property from a burglary? Many of London Locksmiths clients are wondering how they can upgrade the security of their homes so here are a few locksmith tips. How do you go about choosing lock? You want something secure that won't be easily opened but don't know exactly what to look for? The first thing you will want to check is that the lock cannot be bumped. Lock bumping is a simple method of opening a lock using a bump key which is can be purchased very easily for very little. 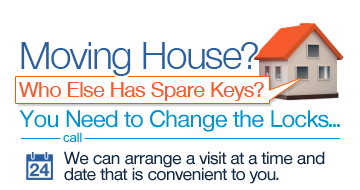 Re-keying allows you to fit a new key to an existing lock, or to alter a lock so it fits an existing key. In case you need a new key to match an existing lock, the locksmith will cut a sequence of notches in the new key so it matches the pins pattern of your old lock. If you prefer to change the lock, but you would like an existing key to fit it, the locksmith will simply change the pins pattern of the new lock so it matches the pattern of notches on your old key. Many people believe that solid locks on doors and windows are not enough to protect their most precious belongings. In order to add extra safety for their money, jewelry and other expensive possessions a lot of people prefer to install a safe in their house. London Locksmiths would like to show you how some simple things the burglar sees in your property may attract him to specifically break into your house.